Our latest installment of the Third Sunday Lord’s Table was held on April 15th during our worship service. The theme chosen for this month’s celebration was, ‘…thief in the night…opioid addiction’ and sought to deal with this terrible epidemic impacting our homes, neighborhoods, and communities all across America. We celebrate our Lord’s Table every third Sunday with an eye to revealing the truth that the Sacrament of our Lord’s Supper is at its very heart a call to action, a call to engage in some of the most pressing social issues and sources of injustice in our culture and society. And in an era of increasing death and destruction caused by misuse of prescription and non-prescription drugs alike we felt that the time to turn and look the other way or to hide behind the misguided notion that, ‘It can’t happen to me or my family’ is over and the time for God-loving individuals of all faiths to step up and become engaged in battling back and seeking the salvation of our every brother and sister mired in the throes of addiction has come. This theme was chosen to highlight this concern and to encourage those participating in our celebration to reflect and take a strong position regarding what our Lord is calling for in this radical call to truly open and expose ourselves to the fact that our brothers and sisters are dying all around us and unless and until good people step up and insist on change across the whole spectrum of the problem and related causes, that it will continue to ravage and destroy. This is no easy task and not an especially safe road to travel, however it is a road we must take as believers in our God of love and compassion. It is from this pine-box-coffin table that we called upon our Lord to bless and from which we received the sacrament. And though it was painful and awkward to do so, for that moment we all were immersed in the true depth of the problem…along with the redeeming power of love that needs to carry forth in all our words and our deeds as we seek to engage and defeat this curse for which so many are responsible from the manufacturers on down to the distributors and even to the current deep malaise that infects the hearts of so many in our society languishing in despair for reasons far beyond their control. For more insight of the day’s thoughts and concern please refer to the April 15th post of ‘The Pastor’s Pen’. People will come from east and west, and from north and south, and sit at table in the kingdom of God. Lord may it be increasingly so that our ministry of love and compassion in your name reaches more and more of your people in need as our awareness of and engagement with all that would continue to divide, separate, or injure us as your family begins to break cycles of addiction and dependence within our homes and the homes of our neighbors. Give us courage and willingness to walk along this path of deep darkness in seeking to find your lost and suffering children. Help us be servants of love in searching out, finding, and leading these broken ones to your healing grace. Help us to be a light that shines even in the black night of addiction so that truly all may begin to feel free to come from the east and the west, and from the north and the south. And it is from this table that we will receive the bread and wine of our sacrament this day…a table of horror, of pain, and of the deep loss that so often accompanies that last pill, that last needle, that one last hit. It is truly a table of fear and hurt…however perhaps a table not inappropriate following just days after our Lord hung and died on a brutal cross himself. This is a table to which our Lord desires we come today, that we might recommit our lives to reaching out towards and intercepting those who are far too fast and far too early making their way closer to what this table represents. Help us to be a light that refuses to hide in the darkness of apathy or ignorance so that truly all may begin to feel free to come from the east and the west, and from the north and the south. According to Luke, when our risen Lord was at table with his disciples, he took bread, and blessed and broke it, and gave it to them. And in that moment their eyes were opened and they recognized him. 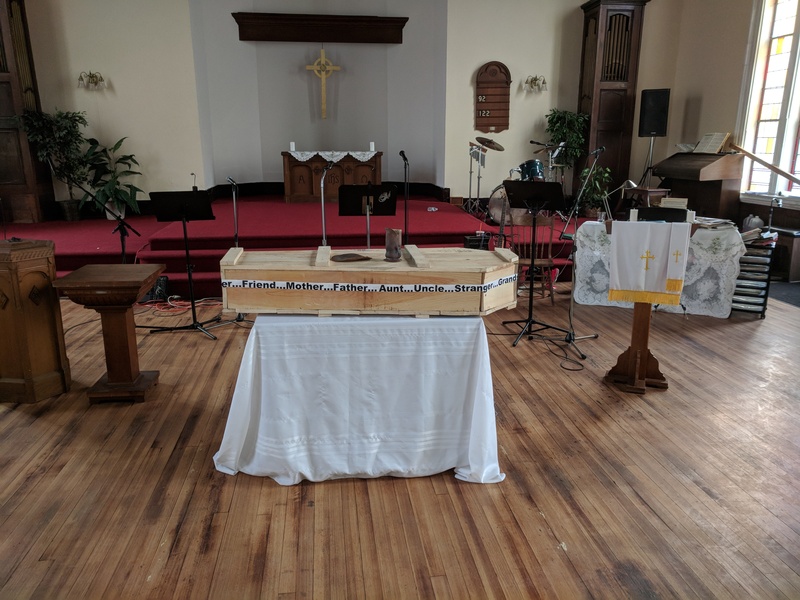 The ‘pine-box coffin table’ here before us this morning is holy because our Lord has made it so through our recognition of, and direct and faithful challenge to it…and because our Lord is always present in the breaking of the bread and the sharing of the one cup. Let us reverence this meal shared together in love, may it bless our bodies just as it moves us to greater compassion and clarity of discernment in all instances of dangerous and injurious substance abuse affecting any of our sisters or our brothers. May we find the way to invite both the one held captive by addiction as well as all those who suffer alongside into the healing circle of your love and grace. Give us the sensitivity, the wisdom, and the dogged persistence to serve as you would and, in your stead graciously caring just as you would by extending your unrelenting and undying love. Leader: In view of the tragic social impact of substance abuse, we accept the challenges of conscience and informed responsibility for ourselves and others in faith and in action. All: Let us prayerfully explore substance use behaviors and make decisions about personal substance use based upon our Lord’s teachings on love. Leader: Help us to faithfully share our faith decisions and reflections on substance abuse with others in relationships of trust and respect, for the elements of our Lord’s healing include honesty, confession, repentance, forgiveness and faithful action. All: Recognizing our responsibility to the wider community, we are prepared to confront, challenge and report substance abuse, manufacture, sale, purchase and possession. Leader: Let us continue to pray for all who are victims of addiction, both those addicted and those who suffer in support of them. Let us ask for guidance and direction as we review our own behavior. All: In honesty and humility we seek to respond to God’s love and wisdom for ourselves and for others regarding the use of alcohol, tobacco, opiates, and other substances in order to be a part of God’s healing love. Let us ever seek to heal the injury of substance abuse…its pain, violence, alienation and despair. Oh Lord, we pledge our help to speak aloud your words of grace. Amen. Holy, Holy, Holy Lord, God of power and might, heaven and earth are full of your glory, Hosanna in the highest. Blessed is he who comes in the name of the Lord, Hosanna in the highest. In the same way, he took the cup after supper, and said, “This cup is the new covenant sealed in my blood. Whenever you drink it, do this, remembering me.” Every time you eat this bread and drink this cup, you proclaim the death of the Lord, until he comes. The grace of the Lord Jesus Christ be with you all.